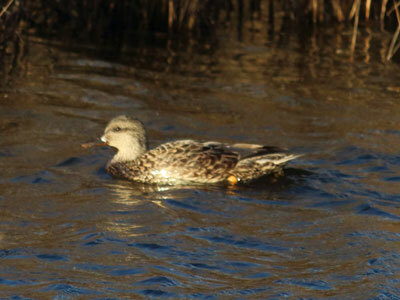 The gadwall is one of several dabbling ducks that winter in the Chesapeake Bay. 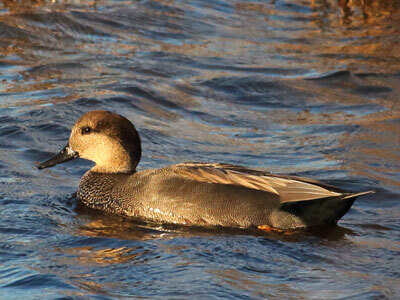 Gadwalls are often found together with teal, mallards, black ducks, pintails, and American widgeon. Drakes can be identified by their black bill, steel-gray sides, and two-tone head plumage (during breeding phase). Females are similar in appearance to mallards, teal and widgeon. In flight, both sexes can be identified by their distinctive black-bordered white wing patches. Gadwalls are sometimes called gray ducks or gray mallards.